MetroFax is a leading provider of Internet faxing with advanced features and flexible usage plans starting at $7.95 per month. Individuals and companies of all sizes have come to depend on the simple, affordable, and reliable MetroFax service. Customers enjoy no contract, no gotcha service and generous monthly allotments of any combination of inbound or outbound faxes. MetroFax offers a choice of inbound toll-free or local fax numbers in thousands of cities across the U.S. and Puerto Rico. And, no matter where MetroFax customers fax within the U.S., Canada, and Puerto Rico there are no extra charges for long distance or transmission time charges. MetroFax is used by thousands of companies around the world. Whether they chose MetroFax to replace a traditional fax machine or server, or transition from an alternative or pricey Internet solution, they now share something in common — they come for the value and functionality and they stay for the unmatched service. MetroFax remains committed to expanding and building long-term customer relationships. MetroFax provides Internet faxing from email, Microsoft Office applications, and almost any Windows-based program. MetroFax is now available on Android and iPhone smartphones. And for customers with an investment in traditional fax hardware, our MetroFax LX Gateway provides a way to leverage existing fax equipment with the power of the MetroFax service. We designed MetroFax to seamlessly integrate into your daily business. You don't need an IT department to manage fax hardware and supplies. Your employees can be better organized, no matter where they are with affordable and reliable MetroFax solutions for the desktop, the Web, or smart phones. And as your business grows, MetroFax grows with you. We have a plan for any size or budget. Our plans are designed to match your business today and tomorrow. Plans starts at $7.95 per month and include any combination of 500 incoming or outgoing fax pages. Send from your existing email account, any Web browser, or directly from Microsoft Office or nearly any Windows software application. MetroFax uses a dedicated fax number either in your community or toll-free number for a national reach. Already have a fax number? In most cases you can transfer it to MetroFax. Download the MetroFax app for Android or iPhone smart-phones. You'll never miss a fax no matter where you are. Want to keep your existing fax machine? The MetroFax LX Gateway transforms it into an online fax machine. Keep the familiarity of your existing fax, but the added features and value of MetroFax. 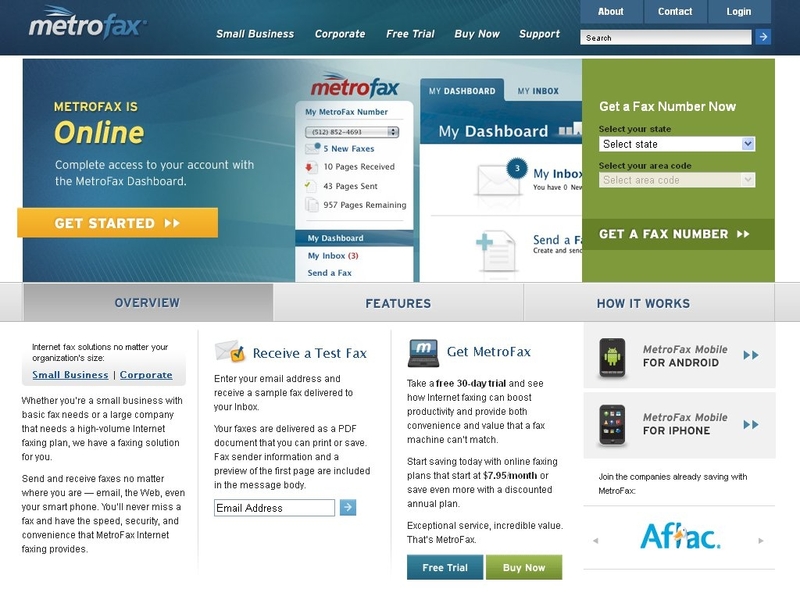 If you use or have used MetroFax in the past, please share this page using the buttons above and be sure to leave a rating and review of the service so other people can make an informed buying choice based on your experiences! It's free and you are not required to register! If you have experience with MetroFax, we kindly ask that you please share your thoughts with others on this website by submitting an honest, detailed review. Your feedback will help prospective clients decide which service provider to choose and is incredibly valuable to the community itself as well as MetroFax's representatives that read this website. Please do not use this form for support inquiries. Be aware that these reviews may also be syndicated and displayed on MetroFax's website, and as such a strict review policy is in effect. All reviews are moderated prior to being published, and reviews that do not contain concise, detailed comments or do not support their associated ratings will not be published. We urge you to be as detailed as possible when leaving feedback, as MetroFax may also use this information as feedback for their business and are themselves encouraged to reply to reviews posted to their listings. I have overall been satisfied with Metrofax, however, when signing up for a mid-high level package I was offered a free trial and accepted it thinking hey, two weeks to a month of free use will save a little money before the billing starts. Turns out, after the free trial is over, they sign you up for their lowest plan, regardless of what you requested at signup before you agreed to the trial, then proceed to overbill the living crap out of you. Calling customer service was useless, they claimed this was in the fine print of the trial agreement and there is nothing they could/would do except upgrade the plan for the next billing cycle. Horrible customer service. Sneaky billing practices. Their fax service is fine though. So, take that for what its worth. I'll probably take my business elsewhere the next time I come across a good internet fax service. Let me say that. I went thru RingCentral for 1 year, MyFax 1 year and eFax 6m. So far nobody can even come close to those guys from metrofax. This is the only service where you can control number of attempts and rings. Also, at the time I switched to them(2 years ago), they were the only fax service to offer html/htm file extensions as an attachments(if you decide to use an e-mail). Since I do everything automatic, thru my website, the faxes are just flawless. 1000 pages for $12.95 plus $0.03c a page after that is the lowest in the market. Those negative reviews you will see here and there are just based on illiterate individuals with limited ability and vision for the service. I only use it because I've used it for years, and every year I think they'll get better, but no, the interface gets worse. It has all sorts of weird problems - best example is that you can't send more than 100 faxes if there is a cover page, and even if you specify no cover page, it gives you a hard time each time you attempt to go over the 100 contact limit. Why does faxing software have to be this bad? I AM GLAD I WENT WITH METROFAX. I RESEARCHED A LOT OF THE COMPANIES, FOR MY MONEY METROFAX IS THE WAY TO GO. VERY EASY TO USE, FRIENDLY SUPPORT, VERY FASSSSST FAXING!!! !, I USUALLY SEND 20 PAGES AT A TIME. IMMEDIATE CONFIRMATION. DON,T WASTE YOUR MONEY WITH OTHER SERVICES. NO FREE TRAIL PERIOD BUT THE SECOND MONTH WAS FREE AND NO SET UP FEE. KEEP UP THE GOOD WORK GUYS, HIGHLY RECOMMEND . I'm the IT director of our company (http://www.aplusbenefits.com), and I effectively replaced our traditional fax machine functionality with MetroFax after utilizing the reviews on this website. The decision has been great, and we've been using between 50 and 60 efax lines through MetroFax for many months now. The service and support is responsive, and the efax features provided are adequate enough for our needs, even if some other providers offer more. Best of all, MetroFax was the only real solution that offered an economical price for us as high-volume fax users. As to reliability, few users have reported any problems, and there was only one day where for about half the day the service was offline. Tip: Make sure to use the computer downloads (efax printer, Outlook efax button, and Office efax support) to give yourself even more power and flexibility with the service. With the exception of a few times where I had a hard time getting a fax to send to a specific number in Canada (other numbers worked fine), I have nothing to complain about with MetroFax... In fact, I REALLY love their interface, it's pretty amazingly simple to navigate and find exactly what you need!